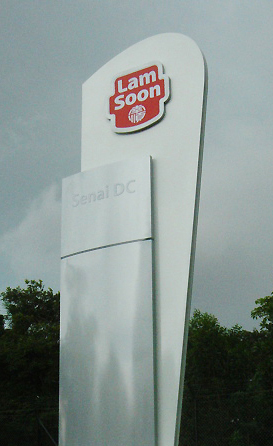 The first project, Senai DC, near Senai International Airport in Johor, comprised a five-star hospitality centre (lounge, retail gallery, a fully equipped kitchen to conduct cooking demonstrations, and a dining area), office and warehouse. 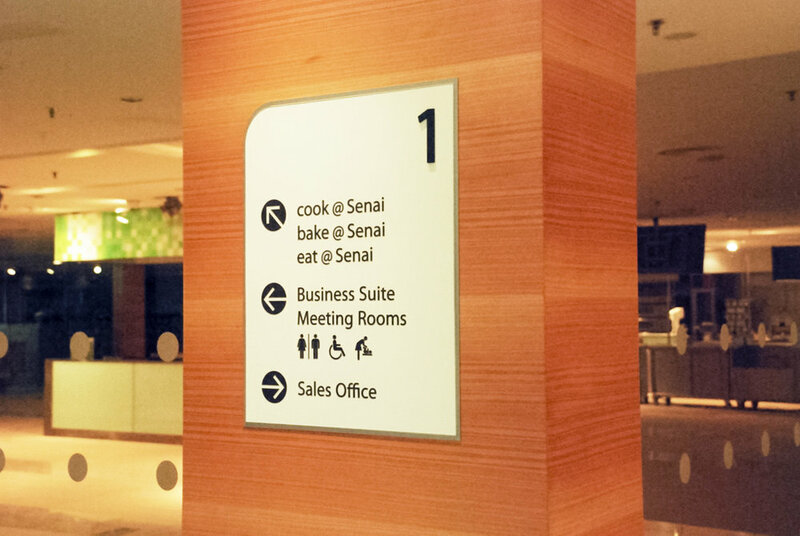 The design of Senai DC’s signage takes its cue from the architecture: the building’s curves, the columns’ tilt at 5º, and the openness of the interior spaces, especially the spacious kitchen and dining areas. The signage system’s core elements were then applied consistently across subsequent properties. Measuring up in preparation for Lam Soon’s new signage system. We have to determine the users’ different viewpoints and viewing distances when designing sign information for the cavernous space of the warehouse. Aside from complementing the architecture, signage system design must also align with the visual identity and corporate culture of the company. Senai DC has a large kitchen and dining area, with an ambience similar to a 5-star hotel. We gave each area a name that reflects its function—cook@Senai, bake@Senai and eat@Senai. A simple system was devised for the precise placement of logo, descriptor (e.g. Pusat Logistik) and address group. 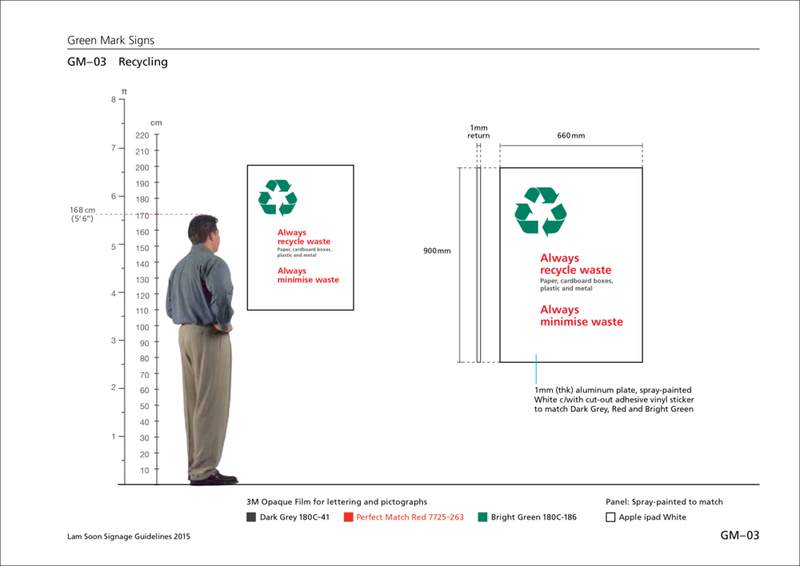 Guidelines for the placement of information on the entrance wall. This will ensure consistency across different properties. With various potential hazards at the warehouse, such as forklifts constantly traversing along the aisles, workers’ safety was a priority that had to be addressed with well-placed caution signs and floor markings. Lam Soon Bukit Minyak DC was the first Green Building Index (GBI)-certified distribution centre in Malaysia. A new chapter on GBI-related signs was added to the Guidelines. Signs were standardised across all four distribution centres. No Guidelines Manual can cover every aspect of a building as the architecture invariably differs from one building to the other. As such, Lam Soon's Guidelines Manual was created with consideration for any necessary customisation. There was also a need for localisation and special needs. In Lam Soon@Marsiling Singapore, the Malay language is used for some signs to cater to its large foreign workforce (although Malay is the National Language of Singapore, it is rarely used in sign systems, except in transportation hubs, e.g. MRT stations and airport). Each warehouse/office has unique architectural features. 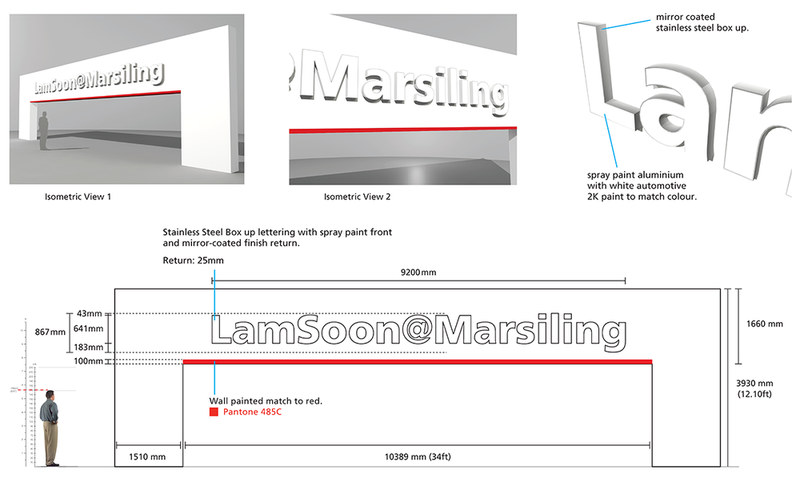 Lam Soon@Marsiling (below) has a large portal which we applied the company’s signature red.